I really, really love having a garden! Yesterday we picked 5 cucumbers and tomatoes. Today we picked enough strawberries to have with lunch. I'm so glad we planted everbearing berries. They just keep producing all season long. In about another week we will have tomatoes coming out of our ears. We have been getting about 3 a day for a while now, but it looks like we are going to have a couple of bushels pretty soon. Our cucumber plants have been amazing this year- maybe all the rain and cool weather at the beginning of the season? Anyway, this challenge has really shown me that having a garden really makes a difference. Of course we can survive on what's in the basement, but I have really enjoyed having the fresh veggies with our meals. I still have a long way to go on my gardening skills, weeding especially, but it is so nice to know we can run out back and pick something to go with dinner. It's really caused me to stop and think about how our ancestors must have felt about their gardens. If their gardens failed, they couldn't run up to Walmart and buy it. It also meant that they wouldn't have anything to can or dry to put into their storage for winter. We are so fortunate that we don't have to rely on our gardens the way they did, although you never know when we might have to. I think gardening is a skill that everyone should at least be aware of and I think I'm going to add seeds to my food storage. You just never know. I recently found out that someone else in our neighborhood is eating their food storage also. I was so excited and we talked at length about what is motivating us to do this. Their family has been doing it for a little longer than we have and they are having great success! It was fun to visit about what is working and what is not. It's amazing how much better you feel when not everyone thinks you're crazy. It occurred to me that I haven't been putting on here what we've actually been eating. Here's a few things: peanut butter and jelly sandwiches, canned fruit and canned veggies at most meals, tomatoes, cukes, zucchini, peas, beans, strawberries (all from our garden), milk (just mixed up some more powdered tonight), burritos with dehydrated refried beans, bbq chicken sandwiches (we had some frozen chicken, but you could easily use bottled), rice and beans,soup, tuna fish, and just tonight we had spaghetti. I asked my family if they felt that we were eating differently and they said no. It's probably because we still have treats and we have chips in our storage as well. Mix the last 3 ingredients together and heat until bubbly. Pour over the rice krispies. Press into a greased 9x13 pan. You can add m & m's or chocolate chips. I even added about 1/4 c. cocoa powder to them and they turned out great! Not very healthy, but yummy every once in a while. If I get enough time this week, I'd like to try a cheese recipe I got. It uses powdered milk. I'll keep you posted! One of the hardest parts of this challenge is not eating out. We have plenty of food here to prepare, it's just so easy to eat out when you have a busy night and you have to fit dinner in there somewhere. I didn't think it would be so bad, but the temptations are everywhere! Coupons for cheap food, TV commercials, a dozen fast food places and restaurants within a couple of miles, Yikes!!!! Today I almost caved. We had a late start to the day, which is never good when you have tons of things that need to get done. It seriously crossed my mind to eat out for lunch for the convenience. We didn't do it, though! I fed the kids before we left and just dealt with being later than I had wanted. We went to Office Max to get some supplies for school and that was a breeze- no food to be seen there. Sam's Club was a different story. Even though everyone had just had lunch, they became oh so starving once inside. Sam's is a place where I let them have lunch a little too often because it's so cheap and also because it's one of the few places that has caffeine-free diet coke. I gently reminded them that we were only there to exchange a defective product and then we were leaving. Mason, the little smartie pants, found a way to finagle some food anyway. His theory is that if it's free it shouldn't count against us- and samples are free, right? He actually had a few good points so I let them try the samples throughout the store. Lucky for them, it was a really good day for samples. Lemonade, mac'n cheese, peanuts, cheese sticks, lasagna, pizza, fresh fruit, smoked chicken and m&m cookies. Yeah, they were happy campers when they left the store. I particularly liked Mason's argument that I should buy them a DVD because it wasn't food, personal hygiene, or cleaning supply related. Ummm....good point, but no DVD. Where Can I Get Food Storage? I'm amazed at how many options there are for food storage these days. There are TONS of different companies you can order from. Many companies have also made their way into Walmart and Associated Foods Stores. Most sites have a food calculator and you can plug in what you want to eat and for how long and it will calculate what you need per person. There are even ready made "kits" you can buy. I was amazed that for $1,999 I could purchase every thing I needed to eat for 6 months. Wow! That seems like a hefty price tag to me. There is also another company out there that will give you a years amount of food and put you on a monthly payment plan. Hmmmm.......I thought we weren't supposed to go into debt for our food storage. 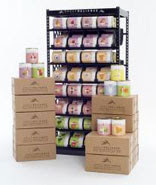 However you look at it, food storage and emergency preparedness has turned into big business. Personally, I like the LDS cannery. You can get a current price list at the church's website and I RARELY ever find food storage cheaper anywhere else. That's because there is no markup- it's not a business, it's just a service they provide to the community. That's right- the community. You don't have to be a member of the church to use the cannery. The only thing I've noticed is that they don't carry everything. No oil, eggs, butter and stuff like that. I also like to watch the case lot sales at the grocery stores and stock up on canned food when it's at the lowest price. For instance, I usually only buy pears or corn once a year. When stuff like that gets really cheap- buy as many cases as you will use and can afford. What Does Your Storage Look Like? Do you have a separate pantry to store your food? Is it maybe your garage? I've heard of people storing in about any place imaginable. Bedroom shelves, under the bed, behind couches, and even burying items in their backyard. I've been very fortunate. When we finished our basement, Steve took a few feet away from a bedroom and built me a food storage room that includes the cold storage under the porch and the area under the stairs. It's really awesome but we are quickly realizing that we are going to need more space. Here's a few pics of some of our storage. One of my favorite food storage blogs is over at The Prudent Homemaker. She has had to do better at storage out of necessity. Her family has been eating out of it for 2 YEARS. Check out her pictures of her food storage under a well stocked pantry. Ahhhhh......... my dream. Something to work towards I guess. So far, I've already noticed a couple of things. We're going to need eggs! I don't know why I don't have powdered eggs, but I guarantee I will after August 15th. Also, I have TONS of peanut butter. It's a great way to get protein and it stores for at least a year. The problem is that Lexii is allergic to nuts (yes, I know peanuts are actually a legume- but they affect her breathing the same as almonds and cashews). This is something that has come up in the past 6 months or so and I never thought to make adjustments within our food storage for it. Luckily we have plenty of tuna for this month, but that is something I'm going to have to address. Something that I forgot to put in that last post is that if there is something storage related or something I need to can, it can be purchased but CANNOT BE USED until after the challenge is over. I felt that I really needed to put this clause in because we only buy things when they are on sale, so it will really cause a problem with my grocery budget if I have to pay full price. For example: I only buy cooking oil once a year when it is at it's lowest price. If I miss a sale like that it could mean lots of extra $$'s. Also, with canning there is a small window of when produce is "on" and at it's lowest price. If I need to purchase 200 lbs. of tomatoes and wait until after the challenge and have to pay $.50 more a pound- that's a lot of money! We have decided that we will not purchase any food, personal hygiene products, or cleaning supplies until after August 15th. The reason we are doing this for a whole month is because we do have items in our fridge and freezer that we will be allowed to use up. There is no way I want to throw out unused perishable items. We just can't afford that so I figured after a week or two those things should be pretty well depleted so we will be strictly onto canned and dried goods from then on. Also, there are a couple of previous commitments we will have to honor. I will be having dinner at girl's camp one night this week and Steve will be allowed to eat at work when they have their "lunch meetings" or when he has to take a customer out to lunch. Since both of these activities are part of his job and his company pays for it, he can do it. I also have to shop for an extended-family campout (I'm in charge of the meals) and an activity that involves an eating contest for Nate. These were also previous commitments so I feel I need to honor them. I know this won't be "exactly" like it would if we were eating our food storage during an emergency. We will be using our refrigerator, stove, and microwave which we wouldn't have if it was the "real thing" but hopefully it will be a good gauge on what we need to do better on. On one of the blogs I read they call this eating from the pantry. You can eat anything and use any modern convenience- you just can't eat out or shop. Can you believe it? Yes, it's me the terrible blogger. It's been a long while since my last post, but I have decided I'm going to do better! Yes, I finally have something to blog about- our journey in surviving on our food storage for a month. The initial reaction I get from people is "why". Why would you want to subject yourselves to something like that? Well, I guess it's because I love food storage! I love buying it, I love having it, and I love that I'm actually following through on something that I've been commanded to do. It's been really surprising to me that most people think you should only bring it out in the event of an emergency. This is what it says in the new Family Home Storage Pamphlet. "Build a small supply of food that is part of your normal, daily diet. One way to do this is to purchase a few extra items each week to build a one-week supply of food. Then you can gradually increase your supply until it is sufficient for three months. These items should be rotated regularly to avoid spoilage. For longer-term needs, and where permitted, gradually build a supply of food that will last a long time and that you can use to stay alive, such as wheat, white rice, and beans". So, if you've built up your 3 month supply it shouldn't be so bad-right? I mean, who just wants to eat for sustenance? I want to eat what we always eat and have happy, non-complaining kids. Lately, I've been seeing such an interest in food storage among members of the church and non-members alike. There are blogs everywhere about it. There seems to be a sense of urgency about storing food in the case of an emergency. People have seen calamities in our country and world-wide and know that they need to prepare because governments can't be relied upon to meet the needs of it's citizens. A wonderful by-product is that people are learning new skills such as canning, bargain shopping, gardening and such in their drive towards self-sufficiency. I also feel that call. I feel the Holy Ghost whispering to me about the need for preparedness so here we are! What I'm hoping to learn from this challenge ( eating out of our food storage for a month) is where our gaps are. What important things am I missing that need to be stored in case of a real emergency. I also hope to inspire someone to do better with their storage and realize that it doesn't have to be 300 lbs. of wheat to be called food storage. Are you as prepared as you think you are? Join the challenge for even a week or two. Tomorrow I will be outlining the rules. At least the rules we are going to live by for the next month. I'm wife and mom to the most AWESOME family ever! This is our day to day journey of trying to figure it all out. Nothing fancy- just us. Extraordinary. "True contentment is not having everything you want but learning to appreciate what you have." "God doesn't give us what we can handle, God helps us handle what we are given." "We can have eternal life if we want it, but only if there is nothing else that we want more."